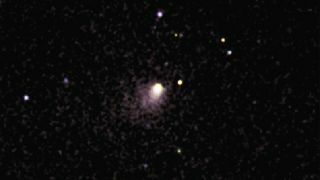 NASA's Swift satellite imaged Comet Siding Spring, due for a meetup with Mars in 2014, between May 27 and May 29. Some scientists were worried initially that Comet Siding Spring could endanger the five probes that will be orbiting Mars during the October encounter. But newly analyzed information suggests that the comet will not harm the probes. In fact, the robots will be able to get an unprecedented view of any changes in the comet as it makes its first trip this close to the sun, University of Maryland (UMD) scientists said. "Comet Siding Spring is making its first passage through the inner solar system and is experiencing its first strong heating from the sun," UMD assistant research scientist Dennis Bodewits, lead researcher on the UMD astronomy team that used NASA's Swift satellite to estimate the comet’s size and activity, said in a statement. "Comets like this one, which formed long ago and remained for billions of years in the icy regions beyond Pluto, still contain the primeval building materials of our solar system in their original state," Bodewits added. NASA's Mars Reconnaissance Orbiter and Mars Odyssey probe and the European Space Agency's Mars Express are all circling the Red Planet now, but two more spacecraft — NASA's MAVEN (short for Mars Atmosphere and Volatile EvolutioN) mission and the Indian space agency's Mars Orbiter Mission — are expected to join them by October. Some of the spacecraft will make observations of the comet's flyby. Siding Spring will fly so close to Mars that its atmosphere (called a coma) will interact with the planet's thin atmosphere, scientists said. However, the material shed by the comet will pose little threat, and the spacecraft in orbit at the time won't need to change their positions, they added. NASA's Swift satellite imaged Siding Spring between May 27 and May 29 this year when the comet was 229 million miles (368 million km) from the sun. Scientists using the satellite found that the comet is on the smaller side, with a nucleus that measures about 2,300 feet (700 meters) across. "Based on our observations, we calculate that at the time of the observations the comet was producing about 2 billion billion billion water molecules, equivalent to about 13 gallons or 49 liters, each second," team member Tony Farnham, a senior research scientist at UMD, said in a statement.